If you’re visiting the Institute of Education, University of London anytime soon you’ll get to see the exhibition I’ve put up in the foyer space outside the library. 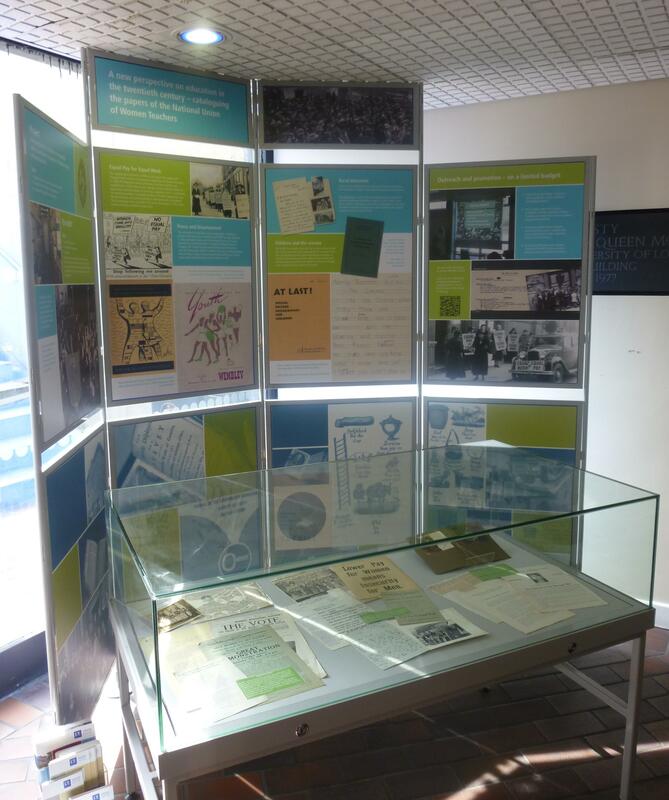 The exhibition is to highlight my work cataloguing the records of the National Union of Women Teachers and to highlight some of the main themes and subjects which run through the collection. Of course I knew that equal pay had to feature in there as it was the original reason for the founding of the union, and indeed, they disbanded when equal pay for women teachers was achieved. However it was really hard to choose which other subject areas to focus on as there were so many to choose from. I’ve tried to give a brief overview in the exhibition in the hope that it entices people enough to want to learn more! What is it about display cases? – they always looks so much bigger when they’re empty than when you start filling them! A colleague suggested measuring the display case and laying it out on a table first to work out where I would put everything (the brown tape denotes the edges of the case). This was a great idea as I quickly realised I had too much stuff for the space – better to realise this in the office than deliberating over material in the foyer! There are more images of the exhibition on the NUWT blog (where this text is copied from). This entry was posted in Archives and tagged archives, education, Equal Pay, exhibition, Institute of Education, National Union of Women Teachers, NUWT. Bookmark the permalink.